Pyramid wireless master clock. Transmits at 902-915mhz using unique channel hopping. Links to the NTP ("Naval") clock servers via the Cloud. Runs unlimited child clocks. The transmitter can synchronize your networked phone system networked computer servers, PC's, and existing wired synchronized clock systems with bells and horns (such as a Simplex system.) Add the signaling module and you can ring bells, connect to your paging system.50,000 sq ft coverage. With no FCC license needed, it is the most simple to use plug-and-play system on the market. This is NTP time (from the US Naval Observatories, where everyone connected to the Internet gets their time signal). It stays spot-on for hours after internet connection is lost. Time source captured from NTP, or optional GPS satellites. Pyramid, a USA company, is known for cutting-edge innovation and it's time and attendance solutions for businesses of all sizes, covering a variety of industries. Pyramid does all of its development and manufacturing in Connecticut, USA. 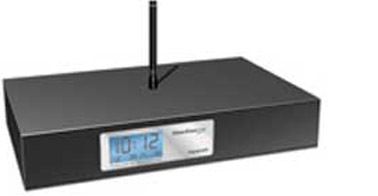 After several years of development and testing, Pyramid has released a full line of synchronized wireless master clock systems and transmitters that can be set up in a matter of hours - sometimes just minutes. Using a frequency hopping transmitter of 915MHZ (902 - 928MHz), it delivers a dependable wireless synchronized clock signal in large buildings and across campuses. Designed to work in court houses, schools, jails, manufacturing, hospitals, multiple buildings. With the Pyramid wireless clock technology, you will save money during new construction, and retrofits.